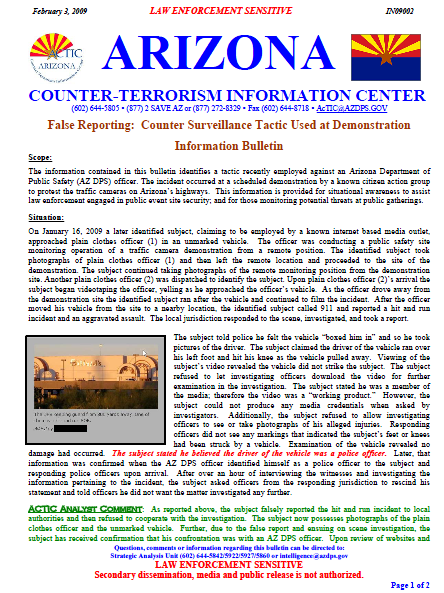 The information contained in this bulletin identifies a tactic recently employed against an Arizona Department of Public Safety (AZ DPS) officer. The incident occurred at a scheduled demonstration by a known citizen action group to protest the traffic cameras on Arizona’s highways. This information is provided for situational awareness to assist law enforcement engaged in public event site security; and for those monitoring potential threats at public gatherings. On January 16, 2009 a later identified subject, claiming to be employed by a known internet based media outlet, approached plain clothes officer (1) in an unmarked vehicle. The officer was conducting a public safety site monitoring operation of a traffic camera demonstration from a remote position. The identified subject took photographs of plain clothes officer (1) and then left the remote location and proceeded to the site of the demonstration. The subject continued taking photographs of the remote monitoring position from the demonstration site. Another plain clothes officer (2) was dispatched to identify the subject. Upon plain clothes officer (2)’s arrival the subject began videotaping the officer, yelling as he approached the officer’s vehicle. As the officer drove away from the demonstration site the identified subject ran after the vehicle and continued to film the incident. After the officer moved his vehicle from the site to a nearby location, the identified subject called 911 and reported a hit and run incident and an aggravated assault. The local jurisdiction responded to the scene, investigated, and took a report. The subject told police he felt the vehicle “boxed him in” and so he took pictures of the driver. The subject claimed the driver of the vehicle ran over his left foot and hit his knee as the vehicle pulled away. Viewing of the subject’s video revealed the vehicle did not strike the subject. The subject refused to let investigating officers download the video for further examination in the investigation. The subject stated he was a member of the media; therefore the video was a “working product.” However, the subject could not produce any media credentials when asked by investigators. Additionally, the subject refused to allow investigating officers to see or take photographs of his alleged injuries. Responding officers did not see any markings that indicated the subject’s feet or knees had been struck by a vehicle. Examination of the vehicle revealed no damage had occurred. The subject stated he believed the driver of the vehicle was a police officer. Later, that information was confirmed when the AZ DPS officer identified himself as a police officer to the subject and responding police officers upon arrival. After over an hour of interviewing the witnesses and investigating the information pertaining to the incident, the subject asked officers from the responding jurisdiction to rescind his statement and told officers he did not want the matter investigated any further. ACTIC Analyst Comment: As reported above, the subject falsely reported the hit and run incident to local authorities and then refused to cooperate with the investigation. The subject now possesses photographs of the plain clothes officer and the unmarked vehicle. Further, due to the false report and ensuing on scene investigation, the subject has received confirmation that his confrontation was with an AZ DPS officer. Upon review of websites and blog chats for the demonstration, it was apparent the demonstrators were taking photographs of law enforcement personnel as they approached the demonstration. Several photographs of local police officers appear on the website to document the demonstration. Additionally, demonstrators are aware of the presence of law enforcement monitoring as confirmed in the attached photograph. This is a potential Officer Safety concern for law enforcement. The motivation behind the false report is unknown, however, the ACTIC would like to remind all officers and those involved with monitoring public safety events to be vigilant and aware of the tactics demonstrators may use to bait officers or disrupt protest monitoring during public safety operations. In the recent past, citizen action groups and other single issue protest groups in Arizona have provoked and/or fabricated situations of duress when they are confronted by law enforcement. It is likely they do this to further demonstrate they are the “victim of unconstitutional infringements to their civil liberties.” This tactic allows these entities to leverage the media coverage associated with their confrontations with law enforcement and often allows them to simultaneously promote their cause. They may be attempting to create a situation in which they can make a civil claim to sue for money; or file criminal charges against law enforcement or another government entity to discourage further actions against the group. Officers are reminded to rely on their training, department policies and experience when conducting operations to ensure public safety while monitoring the protest activities of these groups or responding to incidents at these types of events.